Believed to be one of the earliest cultivated legumes, chickpeas is a small, hard, beige colored bean packed with innumerous health benefits. Chickpeas is also a very good source of protein. Since the glycemic index of chickpeas is 33 making it a low GI pulse and when paired with glycemic load, it is only 6 which makes it a safer option for people with lifestyle diseases. 30 grams of chickpeas provides us approximately 100 calories which can be added in salads to make it a protein rich salad. You can toss and roast your chickpeas with a pinch of oil, salt and have it as a healthy snack. Is Chickpeas safe for Diabetics? Carbohydrates have the most remarkable effect on your blood sugar levels. Thus it is necessary to keep a check on your carbs at a regular basis. Chickpeas is one such legume which is low in glycemic index (33). It is high in carbohydrates but due to its high fiber content, chickpeas will not let your blood sugar levels rise rapidly. 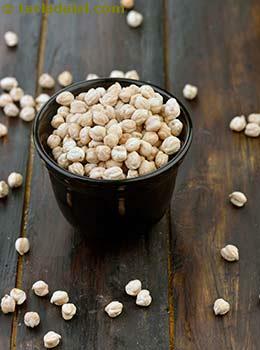 Protein content in chickpeas will also stabilize your blood sugar levels. However remember the portion size plays a crucial role in maintaining your sugar levels. Thus do not go overboard. Is Chickpeas suitable for weight loss? The fiber content in chickpeas will let you chew your food for a longer period of time thus giving a signal to your brain to stop overeating. Hence you will feel satiated. Approximately 30 grams of chickpeas benefits you by giving 8.4 grams of fiber in a go which will keep your appetite under control and do not let you dwell on high calorie foods in between meals. 30 grams of chickpeas gives you around 100 calories which makes it suitable to have during meals and avoid hunger pangs. A few healthier options will be adding handful of chickpeas to salads, trying out different hummus like , Spinach Hummus, Garlic Hummus, Thecha Hummus.